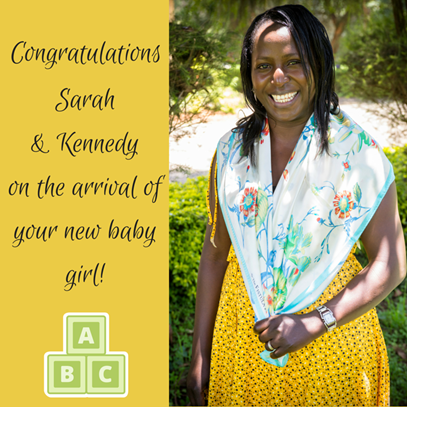 Fistula Foundation is thrilled to share the news that Sarah Omega Kidangasi, our Kenya-based Action on Fistula Communications Officer, and fistula survivor and advocate, has just delivered a healthy baby girl! We are simply over the moon for Sarah and for her husband, Kennedy. You can get to know Sarah by reading CEO Kate Grant’s recount of meeting her for the first time, in this piece for The Huffington Post. We know you’ll be just as inspired by her strength, bravery and dedication to helping other women with obstetric fistula rebuild their bodies and their lives. And while you’re here, please join us in celebrating her new arrival by leaving your congratulatory message below! Scroll down to read messages from other well wishers. How would you like to sign your message? Let Sarah know she has support from your corner of the world! Sarah. You are an inspiration to girls everywhere and it is only fitting that you can now inspire a little girl of your own. Heartfelt congratulations. Wishing you all much happiness. – Maria Onoufriou, U.K.
A Daughter! I may say that my daughter, now she is 31 is more precious than ever…..we are so connected. You are blessed! – Jan Sloss, U.K.
Congrats, Sarah!! We are so happy for you and your family! – Operation Fistula, USA/U.K. Congratulations Sarah and Kennedy. Have a great life together. – Pamela Woods, U.K.
Congratulations Sarah & Kennedy! May your baby girl bring much joy into your lives, you will be fabulous parents I know. – Chantal, U.K.
Congratulations! – Kirsten B. Weeks, U.S.A. Thank you for all your inspiration and hard work from the heart!!! – Elpitha Bruce, U.K.